Mount Pleasant Wesleyan Chapel in Bacup submitted a list of eleven names. There was a memorial in the church, now lost but described here, Mount Pleasant plaque, which listed these men and the 106 who returned. 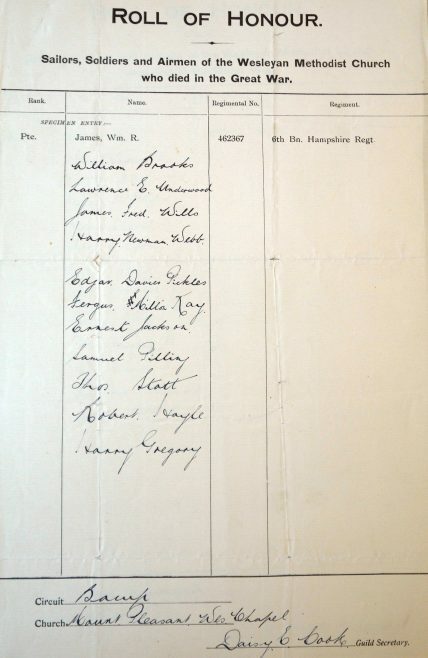 No other record (Commonwealth War Graves Commission, Imperial War Museum or local memorials) can be found of William Brooks, James Frederick Wills or Robert Hayle, so this list stands as their only memorial.